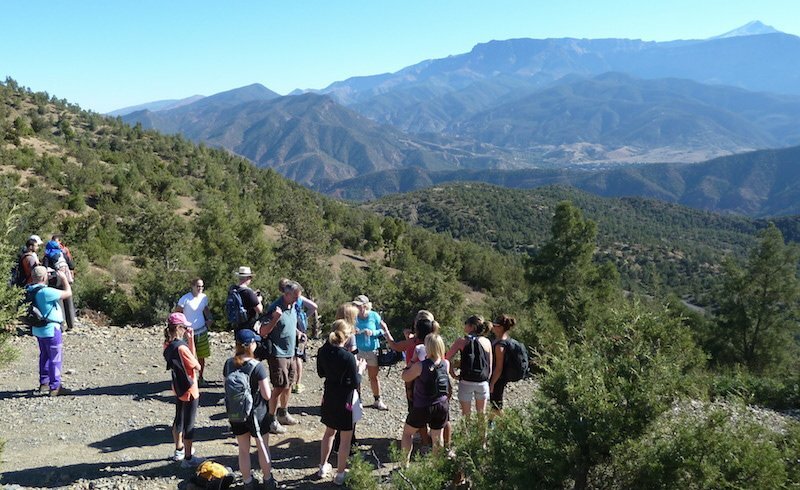 Take in the beauty and charm of the towering High Atlas Mountains from an easy to moderate hike starting in Amizmiz village. You'll enjoy stunning views of the snow-capped peaks and surrounding rural landscape, and gain an appreciation for the local Berber culture. Head south from the city across the Marrakech Plain, through olive groves and fruit orchards - a surprising sight in this semi-desert zone. 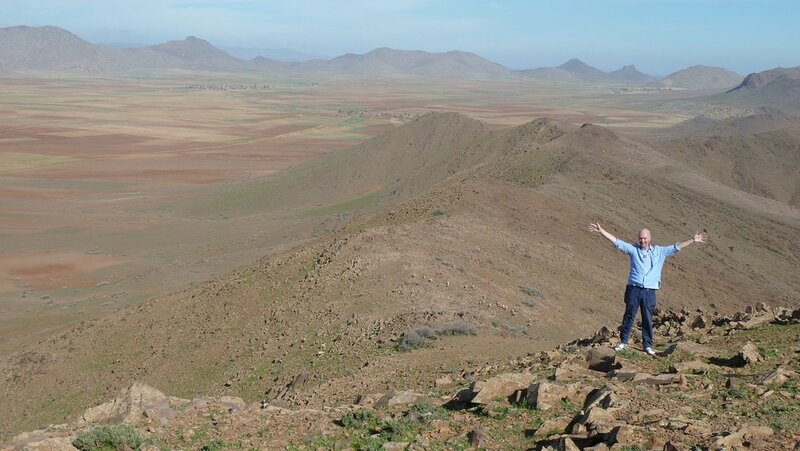 Soon, the High Atlas mountain ridges and summits dominate the horizon as you approach Amizmiz. You can begin your hike in the small, bustling town - especially lively during the Tuesday market - or you can start your route directly into the surrounding hills, valley, and forests. Combine your hike with a visit to a potter’s village where the traditional hand-turning of tagine pots can be observed. Enjoy a picnic lunch in the forest or in a traditional Berber home. The Imlil area is ideal for both gentle and moderate hikes and is one of the most popular areas for trekkers in this part of Morocco. A 90-minute drive south of Marrakech, Imlil sits at 5,577 feet (1,700 m) in elevation, at the meeting point of three large, water-cut valleys. 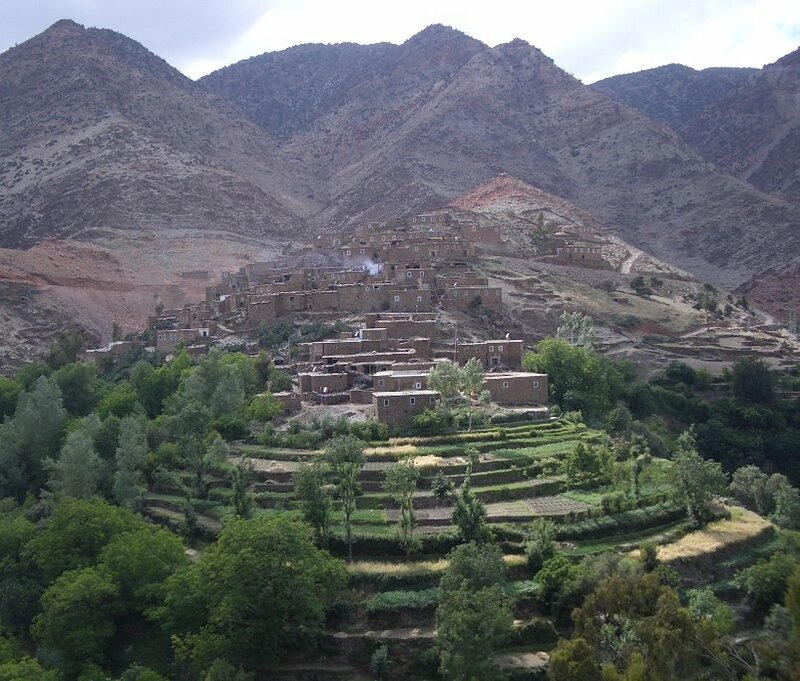 Imlil is the most well known village in the High Atlas and is beautifully situated, not only with the backdrop of the soaring peaks of the High Atlas but by terraced fields with walnut and apple trees. A typical, moderate hike starts in Imlil village itself, first exploring the local market/stores. The hike then continues towards the Toubkal Kasbah that sits high on an isolated rocky outcropping; once a grand and impressive ancient fortress, it is now a hotel and restaurant. The hike follows a small-scale irrigation channel to the Imlil River and on to the Armed Waterfall. The hike uses well-worn tracks and paths. Encounters with Berber mountain people are a most likely added bonus to the day's adventure. The hike ascends towards the village of Armed, passing under the shade of old walnut trees. If you choose to have lunch in a Berber family home, it will be yet another opportunity to relish the culture of the mountain people. 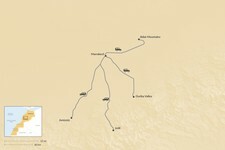 After lunch, the hiking continues via Tamatert to Imlil where you meet your driver for the return journey to Marrakech. 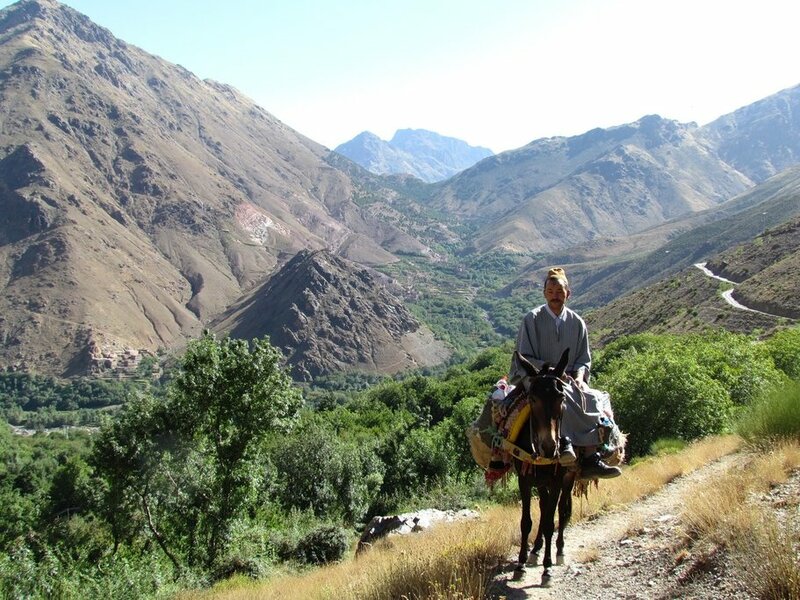 The Ourika Valley lies in the foothills of the High Atlas mountains, around 45 minutes from Marrakech. The scenery in Ourika is full of rock formations, water-sculpted valleys, rich vegetation, and captivating Berber communities and activities. 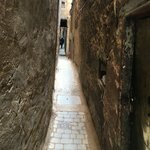 This area offers several excellent day hikes, including the Kasbah Bab Ourika area and the villages of Timalesen, Azro Melloule, Tafza, and Taourirt. You'll encounter forest, cultivated fields, and Berber villages - not to mention the towering High Atlas mountains all around you. 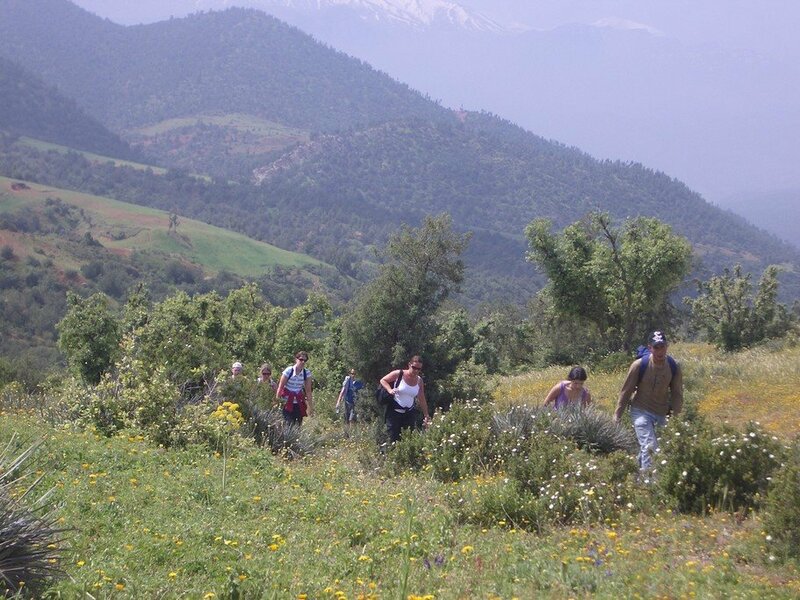 Hiking towards Setti Fatma is an ideal choice, and a favorite weekend destination for many Moroccans. Along the way, you'll see beautiful streams, several waterfalls, impressive cliff faces, and terraced fields where the farmers still use traditional irrigation methods. 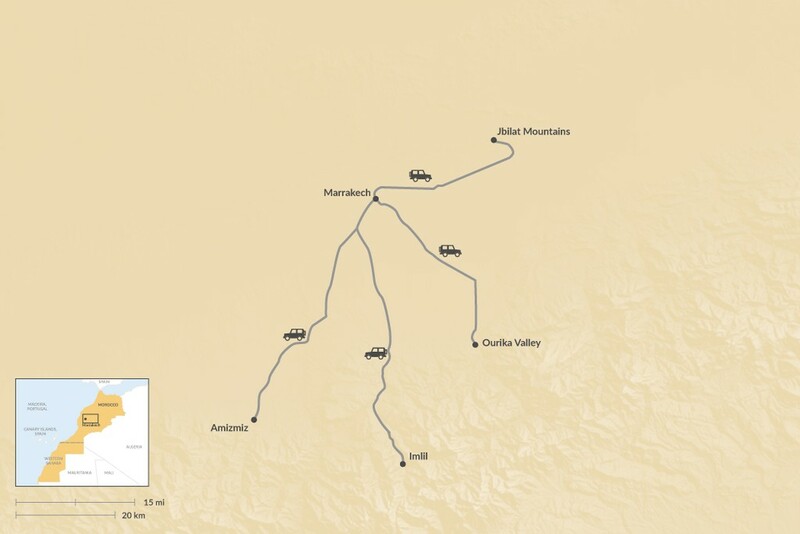 The Jbilat Mountains are an under-explored area, unknown to most travelers visiting Marrakech. Just a 45-minute drive away, the world of Jbilat feels a thousand miles away from the hustle and bustle of the city. Life is very rural and traditional farming is the norm. Many villages are found across the plain, blending into their natural surroundings with traditional structures built with pisé (dried mud bricks). A journey into the Jbilat Mountains in a four-wheel drive vehicle allows for encounters with rural life - you'll likely meet friendly locals as they go about their daily activities. 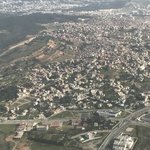 Hiking in this region can amount to a gentle stroll, or you can opt for the challenging (yet very rewarding) ascent of Antar Summit. From the top, you'll relish the tranquil beauty of the rolling mountains, valleys, and weathered granite outcroppings. Make sure you factor in plenty of time to roam, explore, and photograph this remarkable area.